The Fair Labor Standards Act (FLSA) provides that unless covered by an exemption, employees must receive overtime pay for all hours worked over 40 in a workweek at a rate not less than one and one-half times their regular rate of pay. This “time and a half” pay is due whether the employer required the extra work or merely permitted the employee to perform it. New overtime rules entitling millions more American workers to overtime pay were set to go into effect on December 1, 2016. Before that date, employees were exempted from receiving overtime pay if they were salaried, earned at least $455 per week ($23,660 per year) or were in positions considered executive, administrative or professional. 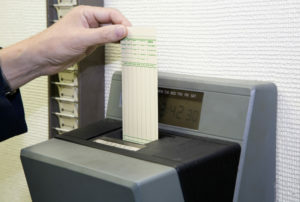 The new rules set the pay threshold for overtime protections at $913 per week, or an annual salary of $47,476. That pay threshold will be updated once every three years, indexed to wage growth over time. However, a federal judge has issued a preliminary injunction blocking the Department of Labor from implementing and enforcing the new rules. It is uncertain how long the injunction will remain in place. It also is unclear whether and when the new rules will take effect. Employers and employees may subscribe to the U.S. Department of Labor’s mailing list to receive the latest updates on this topic. These new rules are going to impact employers, especially small businesses, significantly. Businesses that have an annual gross volume of sales made or business done of just $500,000 or more are covered by the FLSA. In addition, employees of certain entities are covered by the FLSA regardless of the amount of gross volume of sales or business done. These entities include: hospitals; businesses providing medical or nursing care for residents; schools (whether operated for profit or not for profit); and public agencies. Even if an employer is not covered on a business-wide basis, employees may be individually covered by the FLSA if their work regularly involves them in commerce between States (“interstate commerce”). The fact that an employee is paid on a salary basis is not alone sufficient to exempt that employee from the FLSA’s minimum wage and overtime requirements. For the Executive, Administrative or Professional exemption to apply, a white collar employee’s specific job duties and salary must meet all of the applicable requirements provided in the Department’s regulations. From a management perspective, business owners have a few options. The obvious answer is to keep your employees at 40 hours per week or less, even if they were previously working longer hours. Similarly, the other option is to simply pay time-and-a-half for overtime, although those costs are bound to add up quickly. And, of course, employers also have the option to raise employees’ salaries beyond the new threshold, in which case those workers would no longer qualify for the overtime protections. Lynn Pundzak can help workers determine if their overtime rights have been violated, and can help employers to comply with overtime laws. Call Lynn Pundzak at 513-564-9999 for help with your situation. Copyright © 2012 - 2019 Pundzak Law Office All Right Reserved.